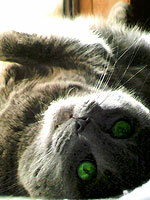 Stockton Hill Animal Hospital’s Pet of the Month is Smokey, from Kingman, AZ! Smokey is a Domestic Short Hair male and is 8 years old. Smokey’s owners are Loretta and Earl Dixon. Think your pet has what it takes to be the pet of the month? Bring in a picture or email a picture of your pet to us @ email@stocktonhillah browse this site.com!